Let’s start with the amount of development. In the 4.5 year period between July 2010 and December 2014 (the last date for which the city published data), about 5,323 units in 59 mid-rise buildings were approved or built on Avenues, and 8,418 more units were in the approval process (source), Totaling 13,741 approved and potential units. In Toronto, the average household size for people in multi-family buildings is 2.0 (source, p. 16). This translates to potential housing for about 27,500 people. The Study in 2011 estimated that there is a potential to add housing 250,000 new residents along the Avenues within 20 years (until 2031). At this rate, in 4.5 years the city should have added (or at least approved) 56,250 units, two times more than it actually did. Now of course, this was just the beginning, and we also don’t have data for the later period, but the rate of mid-rise development definitely did not double since then. Moreover, the first sites that are being redeveloped are naturally the simplest ones and the ones located in the most attractive areas; and, the market was very hot in the period. All this hints that under the current conditions, and especially considering the fast growth of the city, mid-rise development won’t have a contribution as significant as was intended. There are a few reasons for the low amount of development, but they all come down to a very simple factor – it’s very expensive. Why is this type of development so expensive? Under similar conditions, a higher building is usually more expensive to build per square foot than a lower building: a higher building requires a more resistant structure, more elevators, and more life safety measures. However, the midrise buildings that the Toronto policy promotes are generally not cheaper to build than high rise buildings, and often are even more expensive. Why? First, even though the buildings are considered mid-rise by the city, all residential buildings of seven storeys and higher (that is, all mid-rise buildings except those on the narrowest Avenues) are classified similarly and subject to the same requirements of the Ontario Building Code: sprinklering and non-combustible (and thus more expensive) construction. Second, unlike the typical Toronto high-rise condos that go up directly with many repeating floors, the midrise buildings can have only the few lowest floors repeating, making the buildings more complex and construction more expensive. The most important reason for high construction costs though is not the form or code requirements but parking. The midrise buildings are subject to the same parking requirements as high-rise buildings, but the cost to build the parking is much more expensive. The main reason for this is that these buildings are usually on smaller sites than high-rise buildings, and their underground parking garages are smaller and less efficient (for example, more of their floor area is occupied by ramps instead of parking spaces), and a smaller site is also more expensive to excavate. Now, construction costs are only a part of the total development costs, and development costs other than construction (“soft costs”) are also more expensive in mid-rise buildings. Many of these costs are not very different between medium sized and large buildings, making the per-square foot costs much higher for the mid-rise buildings. The first cost of this type is the cost of the approval process. While the policy permits midrise buildings on avenues, they are not part of the zoning. This means they are not allowed “as-of-right”: the developers can’t simply apply for a building permit; rather, they have to go through a process of “rezoning” in the same manner way as they would have to do with a much larger high-rise building. This process is expensive and time consuming (and time is money, because developers pay interest on their loans and have overhead). Design costs are also higher per square foot (and sometimes even for the whole building) in a mid-rise building because of the complex shape and the large number of distinct floor plans. And marketing is another significant cost when developing condominiums: it does not cost much less to market a 100-unit building than a 400-unit building, again making the cost per square foot much higher. So, the buildings are expensive to build and as a result we don’t get that many of them. But are we at least getting the quality we were looking for? In some developments, we do, but too often the full potential for high-quality housing is not realized. Let’s start with the streets that these buildings were meant to help improve. For the most part, the buildings have done their job. They create a nice street wall, they add retail (where they were required to do so), and bring new residents. Has the city done its part in improving the streets? Not really, or at least not enough. Some streets were already nice and have remained so, especially some of central streets with streetcar lines. But many arterial streets, especially further from the downtown core, still feel like only a place for driving and are quite hostile to pedestrians. This is not surprising since these streets were designed many decades ago with the assumption (incorrect even then) that they would only rarely be used for walking. Even where no redevelopment has taken place you’ll see people walking since they can’t or don’t want to drive but still need to get around; they are also where major bus lines run, and people need to get to the stations. But now as the city promotes development right on these streets, improving them is timely. What design changes are needed? On arterial streets, the traffic can’t just be redirected elsewhere; but it doesn’t mean the streets can’t be improved for pedestrians while still accommodating the same volume of traffic. 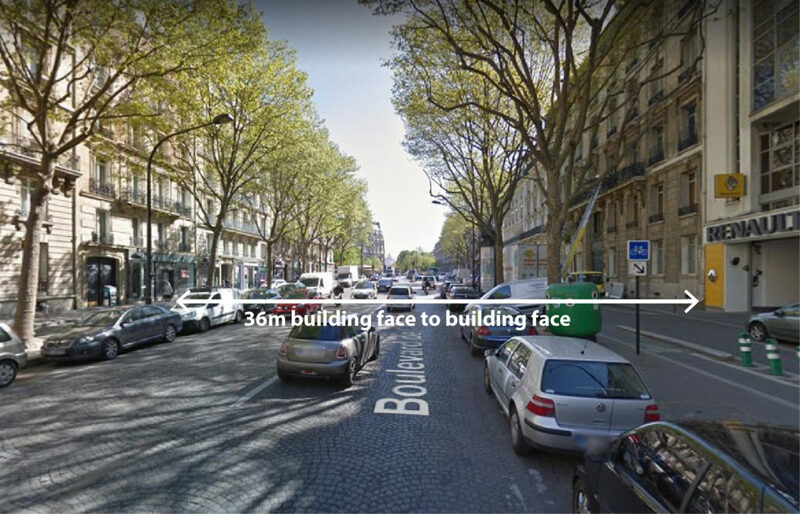 Generally, the changes would improve narrowing excessively wide laneways (which is also important for safety, eliminating lane-ways when appropriate (Road-Diet), widening the sidewalks and planting large trees. Now of course, the city doesn’t have the money to redesign all the arterial streets at once; but even streets that have gone through periodic reconstruction (which is only required once in 25-45 years) have not been redesigned, a huge missed opportunity. An arterial street that has not been transformed to a more balanced “Avenue” is unfortunate to everybody nearby who could enjoy it, but most of all to the people who move to live right on it. If we as a city decide to bring many people to an area by promoting higher density there, we also have the responsibility to make that area livable. What about the units in these new buildings? The interiors are unsurprisingly nicely finished, which is necessary to sell them. But the layouts are often poor, and it is not the fault of developers or Architects. The problem is that the units are often very deep (have large distance between the windows at the front of the unit to the back) and have windowless rooms. In high-rise buildings, the city set a limit to the size of the floor, and the result is that (in newer buildings) units are not very deep and only service rooms (washrooms, kitchens) don’t have windows. But mid-rise buildings are not subject to such limitation; in fact, because they must fit within the “angular planes” but are otherwise unlimited in total buildable area, the developers are encouraged to fill the envelope as much as possible to get the most value from the expensive land. For units that have windows on just one side (that is, not corner units), the maximum unit depth to avoid windowless rooms (unless the unit is very large for its size) is between 7.5 and 8.5 metres. That works in most new high-rise buildings, but in new midrise buildings, the lower floors can have units that are 12 and sometimes even 15 metres deep! If the building has one or two storeys that are a little too deep or have interior corners, the extra space can be used for storage units; but there is very little requirement for this space, and in reality in most cases it is being used for the units themselves. This hurts the quality of all units, but the large depth is especially problematic since it limits the possibility for family friendly units with two or three bedrooms with windows: for most people it wouldn’t make sense to have children live in windowless rooms. Another issue is that in the lower floors of mid-rise buildings, front balconies are either not built or are very small. The midrise guidelines both discourage and forbid large balconies. They discourage them by allowing building to the front property line, forcing developers to choose between building enclosed space and balconies (unlike for example in high-rise buildings, which have to be set back from the street anyway). They also forbid balconies altogether at the lower three floors facing the street. Balconies are of course not a necessity, but they are very useful when living above the ground level, and it’s not clear if eliminating them is really that important for the quality of the street. 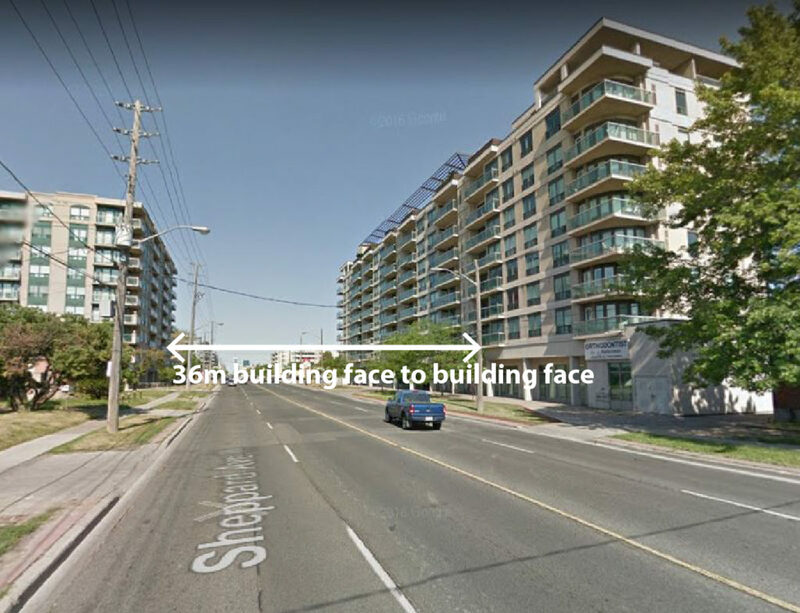 So, these are some of the problems: the mid rise buildings are expensive to build, and not many get built; developers are encouraged to create very deep units with no balconies; and the streets are often still more arterials rather than “Avenues”. In the next post, we’ll propose possible solutions to some of the underlying issues.